Early on Monday morning, Drs. 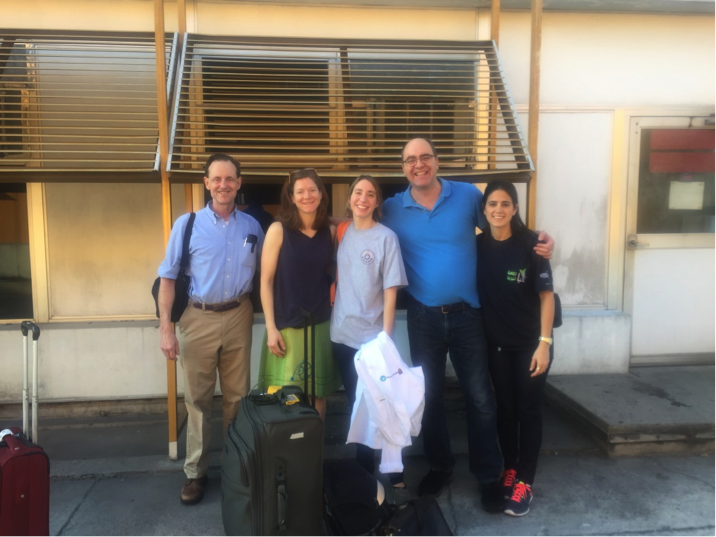 Chris Hartnick (ENT), Phoebe Yager (Pediatric Intensive Care Unit) and Makara Cayer (Pediatric Anesthesia) flew to El Salvador for what would be the first Central American mission for Operation Airway to help children who could not breathe to breathe, and to help those who could not speak to speak. The mission was the result of a phone call a few years ago from Usama Hamdan, the head of Global Smile Foundation, who had travelled to San Salvador, the Capital city of El Salvador, on a Cleft Lip and Palate mission and, while there, had toured the pediatric wards and ICUs and seen many children with tracheostomies in their necks, with no one trained in how to perform the actual surgeries and aftercare to safely remove them. Upon hearing of this situation, Drs. 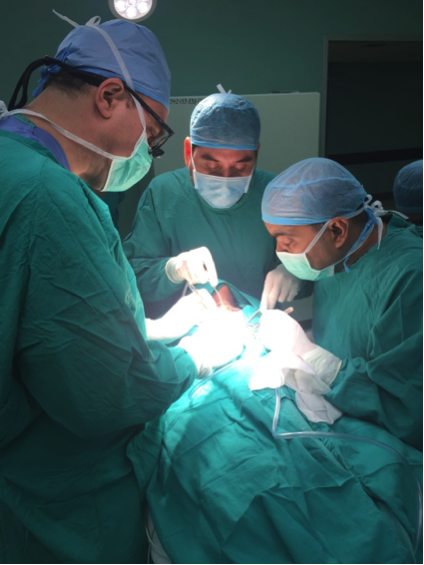 Chris Hartnick and Natan Noviski planned a fact finding trip to explore the problem and see if the Operation Airway team could help. 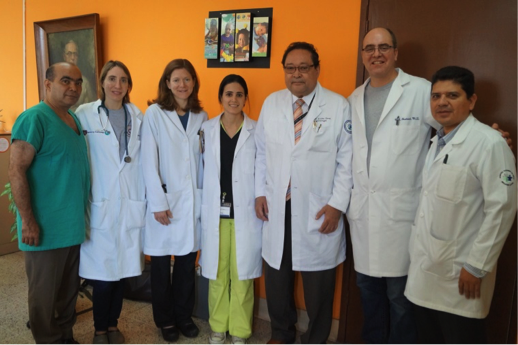 What we found was a wonderful children’s hospital, the Benjamin Bloom Hospital, in San Salvador which is the only tertiary care children’s hospital in El Salvador, a country of some 6.2 million with approximately 2.4 million living in San Salvador. The doctors and nurses there were warm, intelligent and caring, and we were impressed by the level of cases being performed, from open heart cases to large cancer resections. But we were also struck by the lack of resources, which in turn led to real issues, in the PICU particularly. In the PICU we saw child after child on ventilators for infections run amok (sepsis) or from trauma (El Salvador is a beautiful but dangerous country where, in San Salvador alone, there are 25 homicides a day). Whereas in our country such children would receive both sedation and muscle relaxants, these children had no access to these meds, and were awake, struggling to spit out the tubes that had been inserted to help them breathe while they healed. To make matters worse, the tubes themselves were far bigger that those we would use in the States. Our standard practice is to use smaller breathing tubes that have a cuff or inflatable balloon at the bottom which, when blown up, prevents air from leaking out around the end of the tube. The combination of the large tube and the lack of meds resulted in uncomfortable, struggling children; the tube moved up and down in the airway and rubbed it raw, eventually causing a scar to form in the airway which would in turn require a tracheostomy, or small hole to be placed in the necks of these children and a “trach tube” placed there. The large tubes in their mouths could then be removed, but now these children were stuck with a trach tube in their necks for the rest of their lives. These were the children Usama had seen, and why he made the phone call for help. 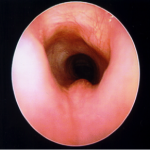 In the States, there are not many children who develop such scars (called subglottic stenosis for the firm scar (stenosis) that develops just below the vocal cords (glottis). 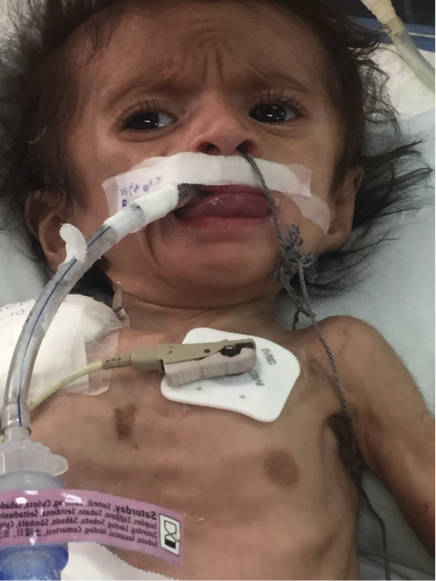 A busy tertiary care hospital may care for 20 such children in a year. In the course of a two-day whirlwind visit, we saw 20 such children, and left determined to come back, help these children, and also provide the local doctors and nurses with the surgical skills and supplies to successfully care for them, get their trachs removed, and allow them to breathe and speak on their own. Flash forward to 2017, and the three of us (myself, Phoebe, and Makara) were flying down, we thought for an initial screening visit to meet the doctors and nurses and to perform a series of bronchoscopies (a procedure where we anesthetized the children briefly and placed a long telescope down through their open mouths and into their airway, to look and take pictures and to diagnose where their airway scars were, how large or extensive they were, and to develop a plan for a future mission. We were prepared either to do no true airway surgeries to rebuild their airway or perhaps one of such surgeries so we could safely test the system and identify areas of need for the future, from more translators needed in the ICU to equipment that we needed back home but had always taken for granted until it was no longer there. We boarded the bus from the hotel and drove through a city buzzing with activity and mopeds even at a very early hour. Two policemen drove behind us as we had hired them for safety as our local team had advised us to do. 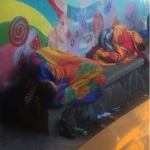 When we arrived at the Benjamin Bloom Hospital, two guards swung the gates open to let us in and there we saw the mothers and fathers and their children sitting or lying on benches where they had spent the night waiting for our arrival. 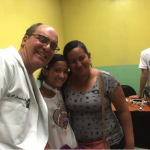 We were met by Dr. Jose Bonilla, an amazing Ear, Nose and Throat surgeon whose quiet, humble disposition at first hid the depth of his commitment to learn how to better treat the children and parents in his care. With him was Evelyn Zablah, a Salvadorian now living in States but who helped Usama with his missions and who is fervently committed to helping the children of her country in any way she can. She had flawlessly arranged every detail of our trip. Soon to arrive to accompany us was Dr Rob Sheridan who directs the Shriner’s Hospital in children and who had graciously agreed to come down to help forge a partnership in which we would fly the sickest and neediest children back to Boston for more long-term care. Whisked inside, we took a quick tour of the ICU, the hospital wards, and the operating rooms, and then we were off to work meeting the children and families. All in all, we screened 13 children with a range of breathing and voice problems, the vast majority with trachs, and the others clearly laboring to breathe and turning a dark disturbing shade of blue each time they cried or tried to draw in a deep breath. We took histories from each parent and examined each child and divided them into a list to examine Tuesday, Wednesday or Thursday. There is not enough space or time to describe the backgrounds of each wonderful child, but let me give you two stories. Rosa is a 11 year old girl who had had pneumonia as a baby, and was intubated and on a ventilator for 3 months at that time. She had to have tubes put in each of her lungs to drain the fluid, and the sides of her chest bore witness to this history with small revealing scars. Unable to breathe on her own due to the scar that had built up in her airway, she had been trached by age one and had had a tube in her neck and been unable to speak for 10 long years since that time. Her father was with her; he had brought her from across the country: a long walk, to a long bus ride, to a night spent on the bench outside the hospital waiting to be seen. 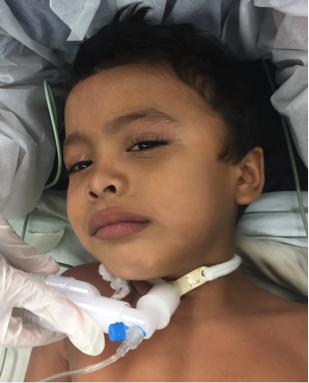 Another patient, Juan, is a boisterous 5 year old, also with a history of pneumonia, a highly prevalent childhood threat in San Salvador. He too was trached and near voiceless. His neck was thick and dark red, as he had pulled at his trach so often the hole around it was rubbed raw, and continually became infected. 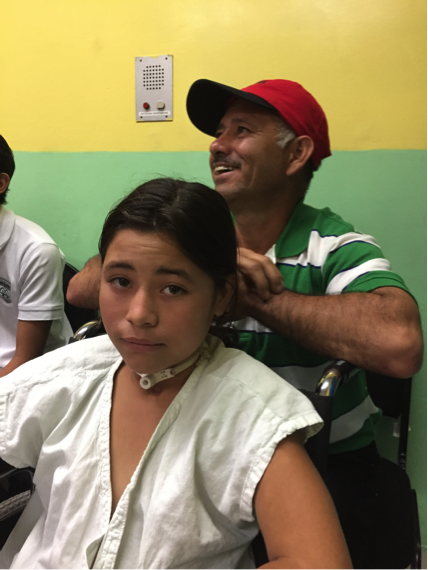 In every way he knew how (but without a voice), Juan was screaming to have his trach removed. We had brought three suitcase of equipment, which we set up before walking through each case with the team. 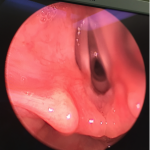 We planned to perform bronchoscopies on three children and then perform an airway reconstruction on Rosa, to begin to teach Dr. Bonilla and his team how to perform this procedure (and the local anesthesia and ICU team to care for her during and after the procedure). 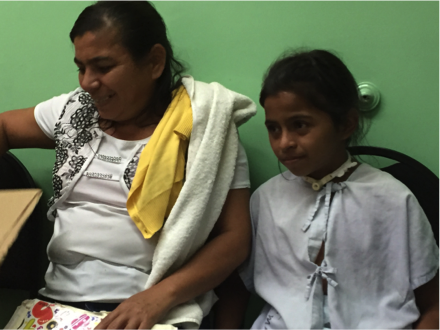 We were determined that by the end of this Rosa would hear her own voice for the first time. 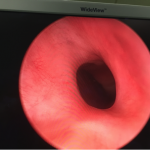 Our first bronchoscopy patient, Judith, had become septic early in childhood, and had been trached shortly thereafter. 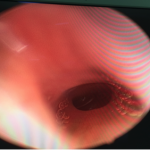 Once the scope was inserted, it was clear why. 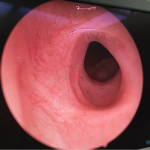 Where a normal airway reveals a large circular opening down a long hollow tube called the trachea between the vocal cords and the lungs, this young girl’s airway revealed just a pinhole opening where years ago the breathing tube had built up walls of scar. We put her on the list to help on the next mission. Our second patient Melanie’s story was quite similar to Judith’s. This child’s scar however was just a little lower and a little thicker; too low and thick for the kinds of airway reconstructions we were prepared to do locally, as she would need to have her neck opened, the scarred section of the trachea completely resected and removed, and then the area of trachea just below and above this stitched together. The post-operative care would be even more complex. She would have to remain with a breathing tube in her throat and airway, sedated and asleep for a week until the suture line was well healed. Then she would need to be slowly removed from one medicine at a time lest she withdraw and seize; meanwhile she would be learning to breathe again, a process which could easily take another week. Due to its complexity, this was the kind of case which needed to be performed in Boston, and we decided that Melanie will be one of our first patients to benefit from our exciting new partnership with Shriners! Our last case of the day was Rosa’s airway reconstruction. This form of surgery entails making a small incision under the right breast and removing a piece of rib that we then carve into the shape of her airway. 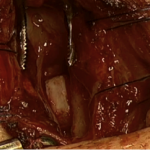 Once the rib was harvested, we made an incision in the young girl’s neck just above the trach hole and cut down through her muscles until we came across her glistening white windpipe. Having found this, we carefully slit it open from the neck up towards the chin, paying careful attention not to damage either her left or right vocal cord (less she have no voice forever) but rather to divide them cleanly in the midline. 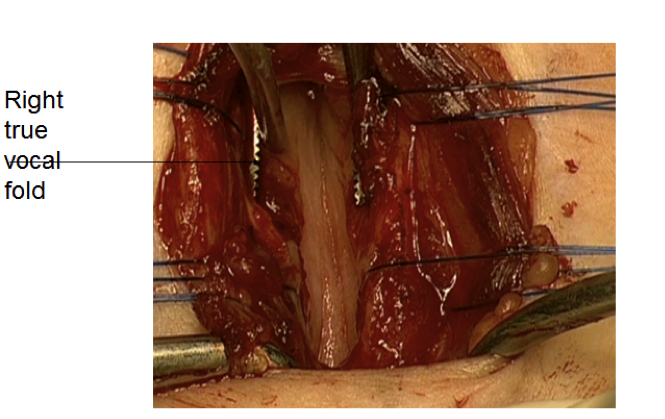 Then we cut through the scar and stitched the carved rib graft in place as an expansion to make her airway larger. All in all, the procedure took 3 hours, and thankfully it went perfectly. 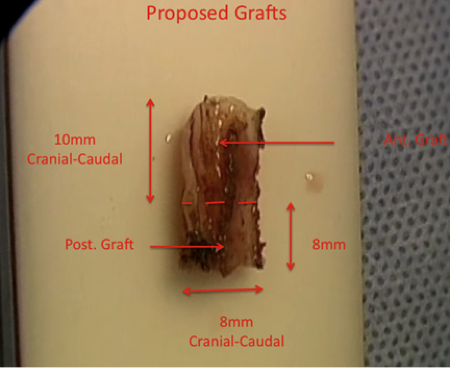 Placing the graft and, then, it fits! With Tuesday behind us, we were geared up for more! On Wednesday, we performed four bronchoscopies to evaluate the children and come up with plans going on forward. We then performed one airway reconstruction (on Juan!). Juan had a graft placed and spent several nights in the Pediatric ICU, full of caring nurses and doctors but, still, quite scary for a young boy. Thankfully, there was a child life team there to cheer him up! 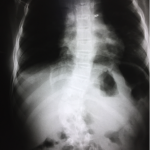 We had planned a third airway reconstruction on Thursday but, on evaluation the patient’s back was quite twisted with Scoliosis to the point where she would need orthopedic surgery. It was clear she would also need airway surgery, as her airway was scarred, and she is a perfect case for the new partnership with Shriners, as she will be able to receive both orthopedic and airway care in Boston! The first rule for us coming down here was “do no harm; although we wanted to help every child we saw right away, these kids had complicated issues, which required careful thought and planning so that we could provide them with the best care possible, and ensure the best outcome for them and their families. 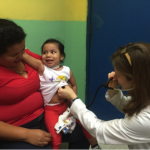 The first goal of our mission was to take care of children like Rosa and Juan, and we felt satisfied that their surgeries went so well, that they recovered nicely, and now Dr. Bonilla will re bronch them in three weeks. Then, if all looks well, he will begin a three-week process of capping the trachs before it is safe to remove them! A second goal for this mission was to begin to teach Dr. Bonilla and his team how to decide when to operate and what procedure, and then how to build a team to perform these procedures and carry out these procedures safely from start (preop) to finish (several months later after the OR, after the ICU, and after the trach h as eventually been removed). To do that, we made use of our team of Pediatric ENT, ICU and anesthesiologists and linked ourselves one to one or specialty to specialty to begin this process. 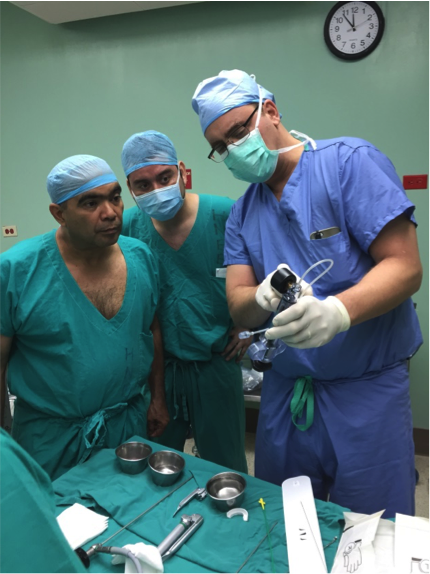 Our goal is perform several more missions before Dr Bonilla and his team are fully up and running and no longer need us. That would be a success! The third and final goal was to establish a relationship between Operation Airway, The Bloom Hospital in San Salvador, and the Shriners Hospital in Boston, with a goal of providing a place where the children who need complex surgery and follow-up could come and be cared for in Boston, and we are in active discussions with Shriners to form a Shriners Pediatric Airway Surgery Program which would become the first program of its kind to serve children from all over the world. This was why Rob Sheridan had flown down. 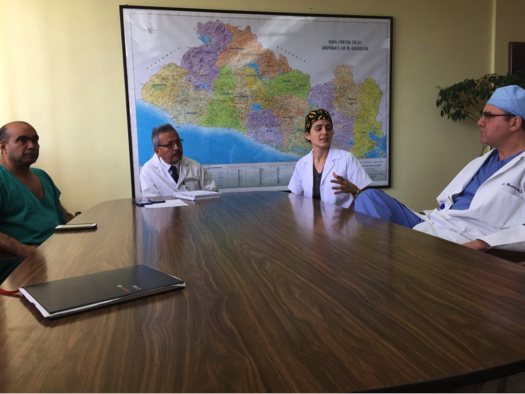 We met as a team with Dr. Susana Abrego, the unbelievably skillful and caring chief of anesthesia, as well as Dr. Selgado, the chief of the hospital itself. The meeting was a real success, as we all agreed on this new and innovative plan to help children on a one by one basis, but also to build an international program to teach and learn together. We are flying home! Tired, pleased, but a little empty knowing there is so much more to do! We made a small dent, but this is only the beginning. The real work is to actually form the programs and alliances we have begun, continue to help children one by one to breathe and speak, find a way to bring to Boston those who need more extensive care, and, finally to help the health care team at the Bloom Hospital grow to become a self-sustaining center of excellence on its own. 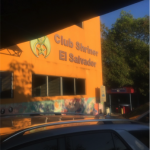 There are other questions that need answering: 1) How to work with the PICU in San Salvador to get better tubes (with cuffs), to get muscle relaxants, to think about nasal intubation to actually decrease the rate of subglottic stenosis and the need for tracheostomies (actual prevention!) and 2) how to think about new, cheap innovations to help the parents of children in El Salvador and over the world to safely suction the trachs and keep them open as too many children right now are dying at home from trach plugging! Do you want to read more or contribute in some way? 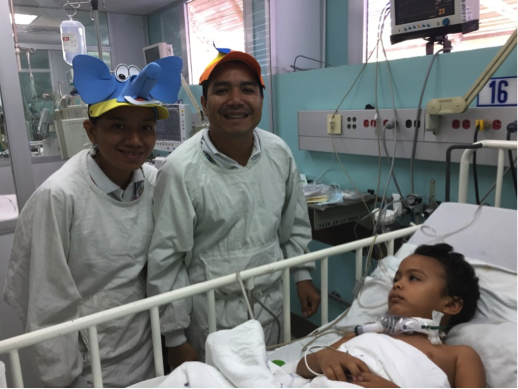 Learn more about Operation Airway whose goal is to help children all around the world receive care for their breathing problems. Go to www.MassEyeAndEar.org/OperationAirway.